Hi all! 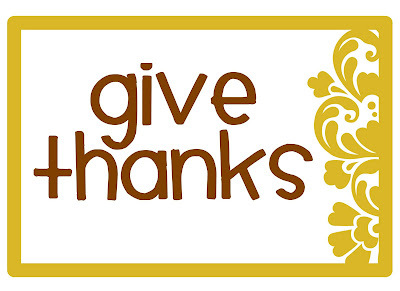 I'm so happy to be guest posting for Dee Dee as a part of the Give Thanks blog event! I blog over at For the Love about anything I want, but mostly frugal fashion. Every Tuesday and Thursday I do a segment called Really Frugal Fashion where I showcase my efforts to stay a hip mama on a not so hip budget. In the spirit of Thanksgiving, I thought I would show you a sensible option for showing up to that upcoming Thanksgiving dinner. It'll most likely be a little chili right? 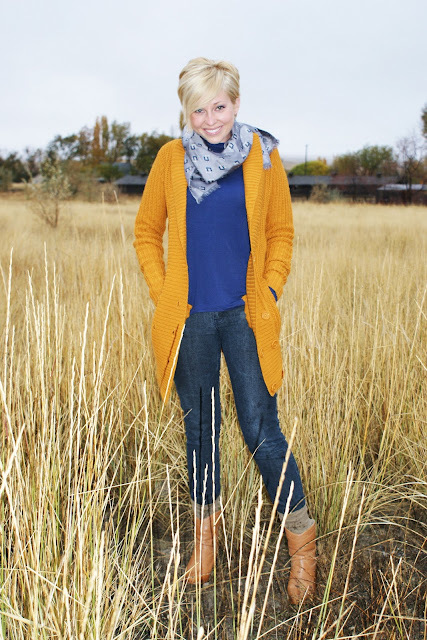 So I thought it would be a good idea to throw on a chunky knit cardigan- especially the kind that only cost $5. A vintage scarf for a touch of festivity, and boots for practicality. Layering is perfect for the occasion. I figure it might be cold until you arrive for dinner, but once you arrive you know it's gonna be cookin! I'm prepared with a statement necklace underneath to replace the scarf. Scarf: Vintage, belonged to my Gram. What a cute outfit! I especially love the cardigan :). For Thanksgiving, I'll be wearing a sweater dress from Old Navy that I picked up at the thrift store for $8!! YA!! Love Sarah and am a huge fan of her blog. Thanks for having her guest blog. Can I just say that besides the adorable outfit...I want her hair! So freakin' cute!!! !